Data: The table below shows the highest daily temperatures (in degrees Fahrenheit) averaged over the month for the cities of Syracuse, NY; Washington, DC; and Austin, TX. 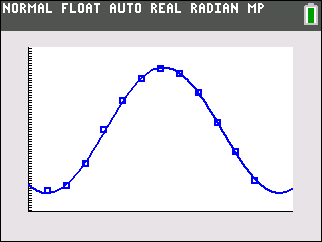 Be sure your calculator is in radian mode! and d is the vertical shift (up if d > 0 and down if d < 0). Notice that the calculator form is NOT y = A sin (B(x - C)) + D, where B is factored out front. In the calculator form, the horizontal shift is found by dividing c in the regression equation by b. 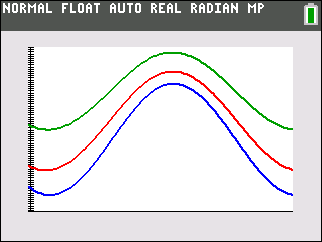 When working with a sinusoidal regression, the calculator will assume that radian mode is enabled. 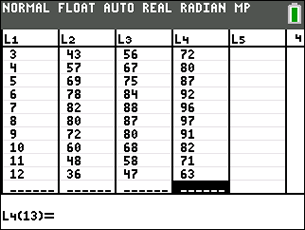 • If your calculator is set to degree mode, the equation will still be given in terms of radians. While this will be a correct equation, plugged-in values will give incorrect answers. 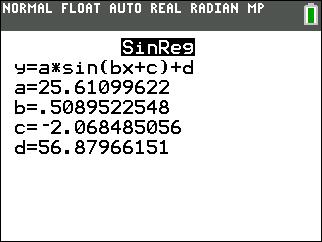 To see correct answers when in degree mode, you will have switch to radian mode (or you can multiply the values of b and c by 180/π). • If you want your graph to follow your scatter plot, be sure you are working in radians. Task: Express answers to 3 decimal places. a.) Determine a sinusoidal regression model equation to represent the temperatures for each of the three cities. b.) Graph the three new equation on the same grid. c.) Do the graphs intersect? Are these results representative of what was observed in the data? Explain. The direction below will show the complete process for finding the sinusoidal regression equation for Syracuse, NY. The equations for the other cities will be done in the same manner. Step 1. Enter the data into the lists. For basic entry of data, see Basic Commands. The month numbers are in L1. Syracuse temperatures are in L2. Washington temperatures are in L3. Austin temperatures are in L4. Step 2. Create a scatter plot of the data. Go to STATPLOT (2nd Y=) and choose the first plot. Turn the plot ON, set the icon to Scatter Plot (the first one), set Xlist to L1 and Ylist to L2 (assuming that is where you stored the data), and select a Mark of your choice. Zoom #9. Step 3. Choose the Sinusoidal Regression Model. · In a sinusoidal regression, the "iterations" is the maximum number of times the SinReg command will iterate to find the equation. Any integer from1 to 16 can be used, but 16 generally gives a more accurate result than smaller integers. Default = 3. Higher values may take more time to compute. · The "period" is the horizontal distance between two maximums or two minimum points. If you leave the period empty, the calculator will take over. · The "store" is the location where the equation will be stored. Default is Y1. Notice that there is no correlation coefficient or coefficient of determination. y = Asin(B(x - C)) + D.
Step 4. Graph the Sinusoidal Regression Equation from Y1. Step 5. Get the sinusoidal equations for the other cities. Step 6. Graph all three cities on same grid. Explain. If you examine the data, you notice that the cities are arranged such that Syracuse is "cold", Washington is "warm" and Austin is "hot" for every month. There will never be a point of intersection.